The Tasting Room is open from 10:30 - 5:00, everyday of the week. Reservations are not necessary, but appreciated. 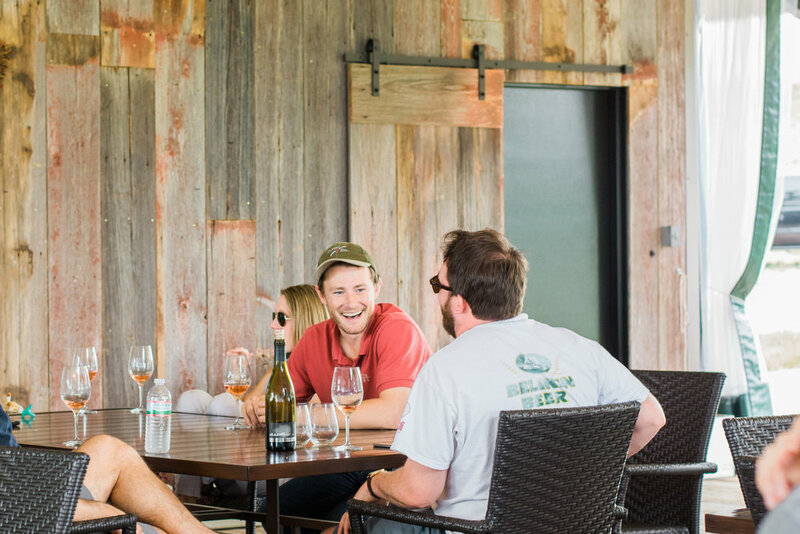 Our winery and tasting room are situated on 100­ acres just west of Johnson City, in the heart of the Texas Hill Country AVA, the second most­ visited wine country in the US! Conveniently located on Wine Road 290, 60 minutes west of Austin, 60 minutes north of San Antonio and 30 minutes east of Fredericksburg, our tasting room has excellent views of the surrounding hill country. We offer tastings in our pavilion overlooking our vineyards. One of our knowledgeable team members will guide you through our current releases for a $15 tasting fee that is refunded with the purchase of two bottles. Walk-ins are welcome, however, appointments are suggested, especially on the weekends. From Johnson City take 290 west towards Fredericksburg. Go roughly 3 miles and look for big propane tanks on the left (south) side of the road. We are the first entrance on the left after the propane tanks. Look for the blue highway sign, then wine barrels and large boulders at the gate entrance. From the west (Fredericksburg, Stonewall, Hye, etc.) take 290 east towards Johnson City. We are roughly 6 miles east of Hye, Texas. Our entrance is on the right (south) immediately following a guard rail about 1.5 miles east of Tow Head Creek. Look for the blue highway sign, then wine barrels and boulders at the gate entrance. Book Your Tasting or Tour Today! Book your tasting or production tour today! We do accept walk-ins, however, appointments are suggested and greatly appreciated. Our regular tasting is a line-up of our current releases for $15/person. We will happily refund your tasting fee with the purchase of two or more bottles. We also offer Winemaker Reserve Tastings every Friday for $40/person. Make a reservation & check the next available dates below.